First, let me tell you that mon mari and I agree that these are the best meatballs we have ever eaten. 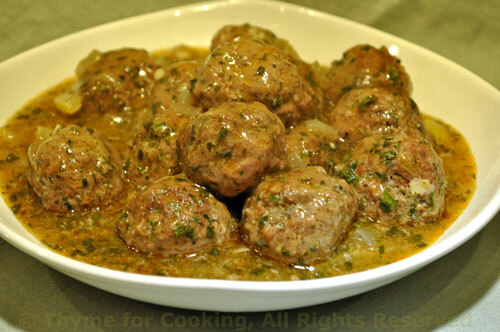 And we eat a lot of meatballs…..
We both love them, they’re dead easy and inexpensive. We could be considered meatball experts! At the very least, aficionados…..
Now that I think of it…. the Slow-Roasted Lamb I made, based on a recipe from the same cook book, was the best lamb we ever ate. I could be on to something…..
Before the meatballs, though, comes the tile. If you recall, back in February we went shopping for tile for the second bathroom. Tile, like most things, is fashion conscious. When we tiled our bathroom back in the US tiles were small, 4 or 5 inch squares. When we tiled our bathroom in Andorra they were huge, 15 by 24 inches or larger. When we tiled the bathroom in the Vendée the were a bit smaller and when we did the first bathroom in this house, the small one on the ground floor, the tiles were smaller still, 8 by 10 inches. Now they’re getting larger, again…. 10 by 16 inches, and they lay on their sides, the long way instead. 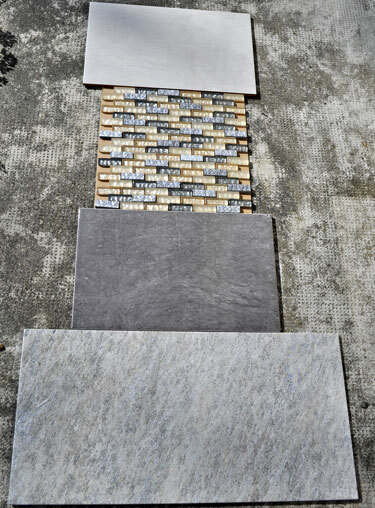 Until now, however, one could find tiles in a wide variety of colors. For some bizarre reason know only to the fashionistas, the current color of bathroom tile must be black, brown or gray…. and with a matte, rather than a glossy finish so that all of the water spots, common in a bathroom, show up best. The entire rant on tile shopping is here. The big one on the bottom (12 X 24) is the floor tile. Mon mari is not happy as it’s too long for his tile cutter…. Had you been in the store with me when I was selecting the tile you would understand how completely unsympathetic I am. Deal with it! The dark gray and light gray wall tiles actually have a bit of beige running through them which doesn’t show up on the photos – thus the tiny decorator tiles. They are actually very small (.5 X 1.5 inches) tiles on a mesh background. The listels or decorator tiles that were meant to go with the gray tiles were truly ugly (IMHO) and blah on top of it. I’ll be able to cut each of these square sheets into 4 listels for the decorative border. Aren’t I the clever girl? Mon mari’s not overly thrilled about that idea either….. See above. They really, really were fantastic! Meatballs: Combine all of the ingredients for the meatballs and mix very well, kneading until it gets almost paste-like. Form into 1 1/2″ (4cm) balls. Set aside. Sauce: In tagine or large skillet, sauté onion in olive oil until tender, 6 – 7 minutes. Add paprika, cumin and sauté 1 minute longer. Add stock, oregano and bring to a boil. Reduce heat to simmer, add meatballs, keeping them separate, cover and simmer 45 minutes. Add parsley, lemon juice and preserved lemons, simmer 2 minutes longer to combine flavors. Did I mention that these were good? I want to make and eat those meatballs ASAP! Wow, they sound (and look) completely delicious. Thanks. You know Katie, you are just evil. You give us a succulent, juicy, delicious-looking meatball recipe, on the first day of Lent. Not that would stop ME, but she-who-must-be-obeyed is a loyal daughter of The Church, and wouldn’t THINK of eating those meatballs, if I made them. Katie – we are meatball lovers in this house too, and yours look mouth watering delicious! This is a must have recipe, thanks. This is my kind of dish. I love tagine cooking! I think I am in love with these meatballs. They are definitely packed with flavour and worth a go. Getting out my tagine, now! Fantastic recipe, Katie. And I love those small accent tiles and can’t wait to see how it all looks when set. Votre mari can have meatballs as a reward for dealing with all the tile problems – you can offer them as the carrot before the donkey !! Gorgeous meatballs, and, if gray and beige and white are only choices, great tiles. The decorative little ones are lovely and youARE clever to make them the border ones. Katie, I’m not sure what preserved lemon is, can I use fresh lemon rind/zest in its place? This recipe sounds comforting, can’t wait to make it. Lisa, they really were good! brassfrog, I always get a chuckle out of how very religious American Catholics can be (my mother included) I’ve lived in 2 officially Catholic countries: Ireland and Andorra and they (including the clergy) take a much more pragmatic approach to The Church. The may not eat meat on Ash Wednesday…. and maybe not on the Fridays during lent if it’s convenient, but that’s about it. Mass is only required on Christmas, Easter and your name day. Ina, meatballs are always a hit here, too. 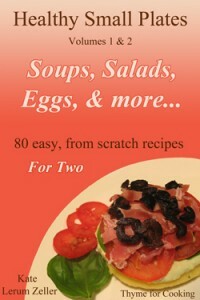 Lydia, I’m having such fun with it – and the cook books…. Christine, thanks – and hope you like the meatballs! manningroad, good thing he doesn’t see through me as easily as you do…..
Elle, I was so disappointed not to find colors – there was a bright purple with red trim and a truly garish lime green…. We work with what we can get…. Linda, preserved lemon is a lemon that has been brined in a saly solution, usually for several weeks before using. They need to be rinsed, and only the skin is used. They’re not as tart as a fresh lemon. So – yes, use fresh, but not as much and you may have to add a bit of salt. I love meatballs. Can’t wait to try them with a Moroccan twist. I think I need these. I think they are instrumental to my health and well-being. Yes, I definitely need these meatballs. looks absolutely delicious. do you have a recipe for the preserved lemons? Elle, hope you like them! Claudia, I’m so thankful I posted them in time to help! Whew! kitchenroach, sure do: http://www.epicurious.com/recipes/food/views/Preserved-Lemons-231570 This is similar to the one I have – but without the cinnamon sticks and cloves. You can also buy them in international food stores and, sometimes I find them with the olives in markets. They keep well in the fridge, provided they stay covered with brine. I’m several years late finding this recipe. I had a jar of preserved lemons and ground beef and google found this recipe. This was delicious. I would not change a thing and I will make again. Glad you found it and liked it. I was just planning on making them again tonight. It’s still one of our favorite recipes!